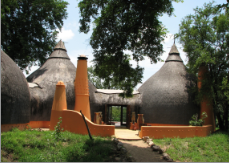 See also our article about Garonga Safari Lodge *boma; means British Officers Mess Area in former times. Nowadays the area where you sit in a circle around the fire to have your dinner during safaris. Cape Town Tour Guide and ATA Chapter member Dan Dunn (right) helped make our final week in Cape Town one of the most memorable ever. Dan introduced us to Thope Lekau (far right) and started off a beautiful friendship. We enjoyed an overnight stay at Kopanong, a charming bed and breakfast which has been featured in a number of hospitality trade magazines in South Africa. Now we know the reason why. Did you know that there were penguins in South Africa? Now you do! Visitors to the area will discover an entire colony of Jackass penguins lounging and fraternizing (with each other, not the tourists) at a local beach community called Boulders, not far from Cape Town. There are dozens of more such attractions to come, on this site. We look forward to filming the little guy on the right and his entire family as they dine on Southern seafood delights. Most images in this section are courtesy of Cape Town Tourism. Above photos by Muguette Goufrani. Click for larger photo of penguins. The Cape's Two Oceans offer some great beaches for swimming and places to enjoy your favorite water sport, including sailing, salt water fishing and scuba diving. 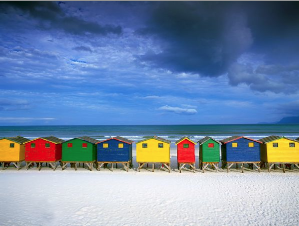 The photo below courtesy of Cape Tourism shows the colorful 1920s style bath houses at a local beach. More to come. In another section, we talk about the Amboni Caves in Northern Tanzania at Tanga near the Coast and Pemba Island. 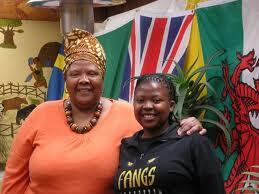 Now we've news about the famous caves of South Africa, including the Cango Caves in the Karoo area. The total length of this underground attraction is 5km. It is said that the word "Kango" is derived from the San or Khoi language (relatives of the Bushmen), and means " Water between the Hills." Karoo is a Hotentot word meaning "extremely dry or bitter." This wonder of the world is located near Oudtshoorn, 400 km east Cape Town. The caves are said to have been inhabited for thousands of years. Underground Music? Just inside the cave's broad entrance is a huge underground theatre area, where musical concerts can be staged for up to 2,000 visitors, a special attraction during local holidays and festivals. As you might imagine, the acoustics are almost perfect. A National Treasure. Dedicated as a National Monument in the early part of the last century, the incredible Cango Caves have a variety of unique halls and chambers with limestone formations such as the Pipe Organ, Cleopatra's Needle, Fairy Palace, Throne Room, Bridal Chamber, Roman Candle and Crystal Forest - names that conjure up all sorts of impressions for the imaginative visitor.